In 1984, the Celtics defeated the Lakers in a seven-game Finals, winning game seven 111–102. Bird averaged 27.4 points on .484 shooting and 14 rebounds a game during the series, earning the award of Finals Most Valuable Player (MVP). Bird was also named the league regular season MVP for that year. In 1985, however, the Lakers avenged the loss, defeating the Celtics in game 6 of the Finals in the Boston Garden. In a losing effort against Los Angeles, Bird averaged 23.8 points on .449 shooting, 8.8 rebounds and 5.0 assists per game. That year, the NBA again named Bird the league MVP. In 1984 Bird earned the award for Most Valuable Player by defeating the Los Angeles Lakers in a seven game final. The following year, the Boston Celtics would have another incredible winning year by defeating The Rockets in six games. Bird again was honored with the Finals MVP Award for that year, averaging 24 points, 10 rebounds and 10 assists. In the 1983-84 campaign, the Celtics returned to the NBA Finals and faced off against Magic and the Lakers. In a spectacular seven-game series, Boston defeated the Lakers, winning the seventh game 111–102. Larry Bird averaged 27 points and 14 rebounds a game during the series. He was named the Most Valuable Player (MVP) of the Finals. 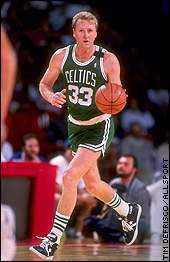 Bird was also named the NBA’s regular season MVP for that year. The Celtics returned to the Finals to cap the 1984-85 season, and once again battled the Lakers. This time it was LA’s turn to win, but Larry Bird was once again named the NBA’s MVP. In just a few short years the Celtics/Lakers, Bird versus Magic matchup had become one of the greatest rivalries in sports, followed by millions of fans nationwide. Significant changes were made prior to the 1983-84 season. David Stern, who had been the NBA’s Executive Vice President, had taken over the role of Commissioner with the retirement of Larry O’Brien. Under Stern’s watchful eye, the NBA would continually expand, and the NBA would become one of the most popular sports league in the world thanks to his marketing vision. On the court, the league’s playoff format was revamped, and expanded to include 16 teams (8 from each Conference). Each of the Divisional winners would no longer receive byes, and thus a team would now have to win four playoff series to become the champions. During the regular season, the Celtics (62-20) reasserted themselves as the most dominant team in the East, and it appeared the Sixers (52-30) had tailed off. In fact, the Sixers were severely upset in the first round of the Playoffs against New Jersey (45-37). The Celtics would advance to meet Milwaukee (50-32) in the Eastern Conference Finals, and easily disposed of them in 5 games to make another appearance in the NBA Finals. The Lakers (54-28) were the class of the Western Conference, and easily outmatched their opponents in the playoffs to advance to another showdown with the Celtics in what would be the first of three classic Lakers-Celtics NBA finals. For years afterward, the Lakers would rue the title that got away from them. The Lakers won the first game in Boston, and led Game 2 115-113 with 18 seconds left and possession of the ball. However, an errant pass by Worth led to it being intercepted and a lay up to tie the score. Boston then prevailed in overtime. The Lakers came back hard the next game in LA and easily won Game 3. In Game 4, Boston became more physical to slow down the Showtime attack, and the Lakers were visibly shaken. Boston won that game in overtime. Continuing its rough and physical play on the Lakers, and won Game 5. Los Angeles retaliated to win Game 6, setting up a decisive Game 7. Boston’s F-Cedric Maxwell played unbelievably and the Celtics captured the NBA title. Larry Bird was named Finals MVP to match his league MVP.